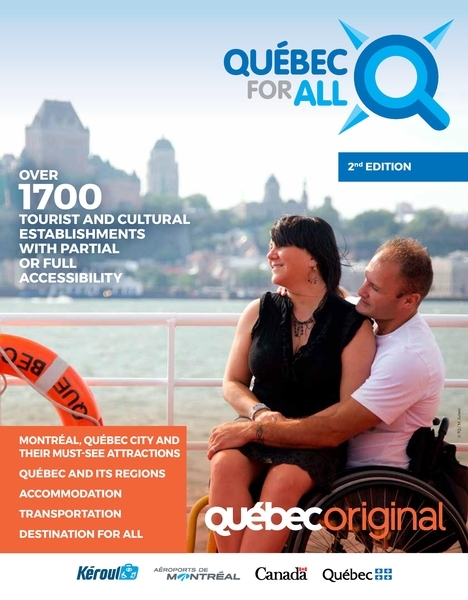 Québec for all is a database of over 1,700 tourism and cultural organizations and businesses certified fully or partially accessible by Kéroul, spread across 21 regions of Québec. Do you have physical limitations? Do you like to have fun, tour and travel? Well then: pack your bags and bring your loved ones along! Québec has put a great deal of effort into making tourist sites and services accessible to visitors with special needs. The province may be vast, but that’s no reason for its numerous natural and cultural attractions to be off limits to someone with a disability. Visit Québec for all's website. In 20 pages complete with photos, discover must-see attractions in Montreal, Québec and other regions in this 2nd edition of the magazine. Québec for allis a magazine and an interactive online platform featuring more than 1,700 tourist establishments that are partially or completely accessible for people with disabilities. The magazine includes plenty of tips and tricks to help your visit to Quebec go off without a hitch. As for accommodations, we focus on establishments that offer curbless showers, space under beds or unique experiences. Finally, learn why Victoriaville was honoured as the first-ever recipient of the Destination for All certification! Download the PDF version of the magazine.